Today was a very special day for me. 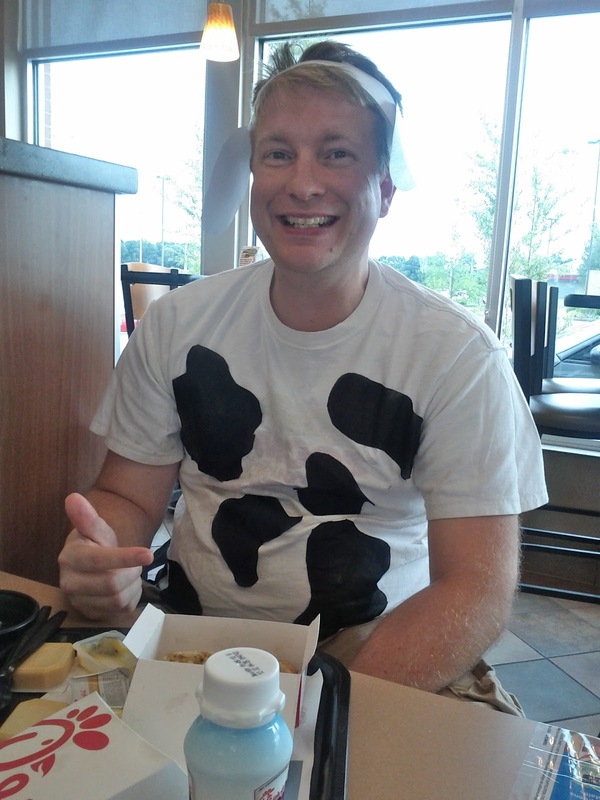 It combined many things which I enjoy: silly fun, free food, and Chick-fil-a. 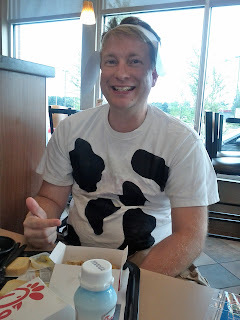 Today was Cow Appreciation day. And this year if you wore a cow accessory you got a free sandwhich, but if you dressed from "head to hoof" you got a free meal of your choosing. So how could I not go for the head to hoof option. 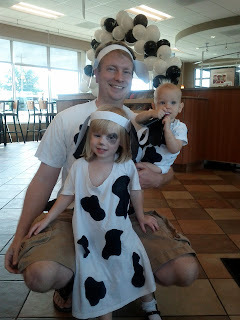 I've seen other friends post pictures from years past but this was the first time we celebrated Cow Appreciation day in our family. Mostly because we finally have a Chick-fil-a out here in Millington and I actually knew what day it fell on. Are you ready to see our herd? I set the camera up on the deck's ledge and used the self time to grab a quick picture before we headed to enjoy dinner. I stopped by Walmart on the way home from the gym today looking for black contact paper. They didn't have any so I settled for fabric. I spent $1.50 and an hour of nap time on our costumes. I used spray glue to temporarily tack down on spots on some white t-shirts. They peeled off nicely and are neatly stored away in an envelop to use next year. 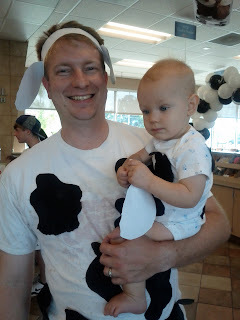 The ears and tails (on our backsides of course) were printed off Chick-fil-a's website where they provided costume kits. Moooo! Not knowing how crowded it was going to be we got dressed and headed to Chick-fil-a around 5:15 before the dinner crowd started coming in. We were the first ones there for dinner that were dressed up. The other people eating chuckled quite a bit at our get up. But the employees all made a big stink and came out to tell us how cute our kids were. 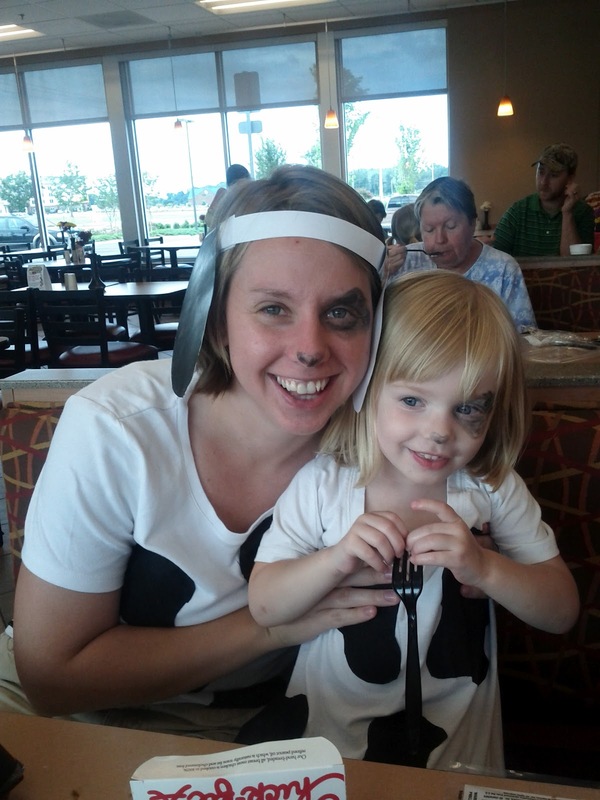 Sarah was grinning ear to ear and mooed for the employees. I snapped some pictures with my cell phone while we were there. Since Cody was dressed up he even got his own kids meal. He's a picky eater and right now he pretty much only likes meat. He won't touch regular fruits and veggies offered finger food style (he'll still eat them pureed). But he thought his grilled chicken nuggets were yummy! After I got home I was floored by the snide responses from my facebook friends on the pictures I posted while we were there. I was actually a little annoyed and got irritated because people were missing the point. Mostly they were giving crap about Chris's picture. A few OMGs and implications that Chis is whipped and was forced into doing this. A lot of comments telling me I don't know how lucky I am to have a husband who would put up with that. And I got a little fed up. The point was not to save $5. Taking my family out to dinner at Chick-fil-a is not going to drain our bank account thank-you-very-much. The point was to do something fun and silly together as a family. To make memories together. To laugh and play together. To do something that Sarah would enjoy with her mom and dad and Cody. The point was to have a good time. And we did. I understand that dressing up in ridiculous outfits and going out in public isn't everyone's idea of a good time. But I have a 2 year old, it is her idea of a good time. She's young, and sweet and doesn't care that she looks silly. Can't we just embrace that and enjoy it together. Have we become so cynical that we'll sneer at husband and wife who can still laugh at a little bit of whimsy. Yes, I know I have a fantastic husband. When I heard about this 2 days ago I called him at work and told him of my plan and asked if he wanted to go or if I should take the kids for lunch. He was quick to say, "Yes! Let's go to dinner as a family!" I don't need to be reminded that my husband is a "good sport" as if to say this was forced on him. I have a husband who knows that family is the most important thing and treasures these times that we get to spend together. Because before too long we'll have a couple of teenagers who won't want to go to dinner with us on a Friday night dressed up like cows or not. So I'm going to do every crazy and ridiculous thing within reason with my children while I can. If that's not something you care for, then just don't comment. You know I had to run over to FB to see what you were talking about after reading your post here. Yeah, I agree, get over it people! It's something silly and fun. 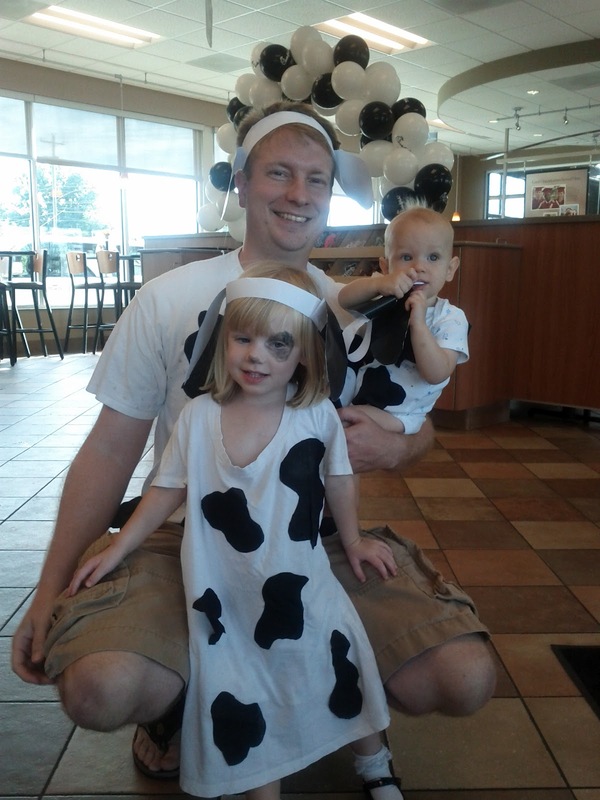 And for the record, last year I took all 6 of my kids, the oldest kids girlfriend of the week, and another friend and we ALL dressed like cows. So yes, even teenagers will be silly once in awhile too. Heck, the teens even put cowbells around their necks! It was a fun memory we have and I really don't care how ridiculous we looked. Good for you Natalie for having a family that values being a family! Holy balls! I can't believe they would leave comments like that on FB. Dustin was totally game, too and we had a huge blast. It was so fun. Those others folks are missing out BIG time. Your herd is adorable. Way to take every opportunity to be silly. I love it.